CUBA is the name of one of the city’s earliest known graffiti artists, still operating today. The 46-year-old Baltimore transplant moved to the Mission in 1985, when he was 21 years old, “with full intent of getting a scene brewin’,” he said. Inspired by the Mission’s colorful flair for expression through street murals, CUBA set out to make a name for himself in the neighborhood’s alleyways and derelict buildings. Earning a reputation as a prolific graffiti talent, he eventually joined with other writers and artists in the Mission, and has since woven himself into the creative fabric of the community. 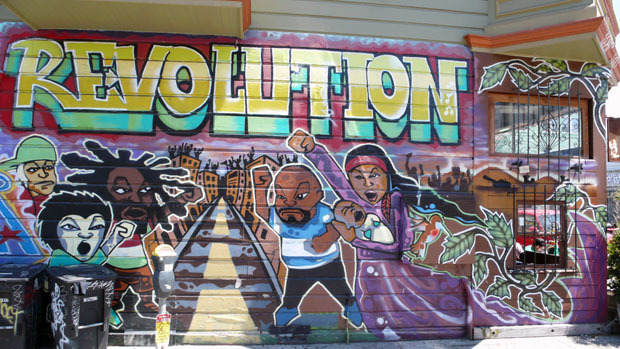 CUBA’s connection with the evolution of street art in San Francisco is self-reflective. As the culture has transformed, so has CUBA, and vice versa. Most recently, CUBA helped paint an 80-foot-long mural celebrating the San Francisco Giants and their World Series victory that glows orange at the corner of Columbus Avenue and Powell Street in North Beach. But his work shines brightest in the Mission. After years of negotiating, CUBA earned creative rights to the cement barrier at Mission National Bank on 16th Street, and sprayed a mural of children playing and reading. 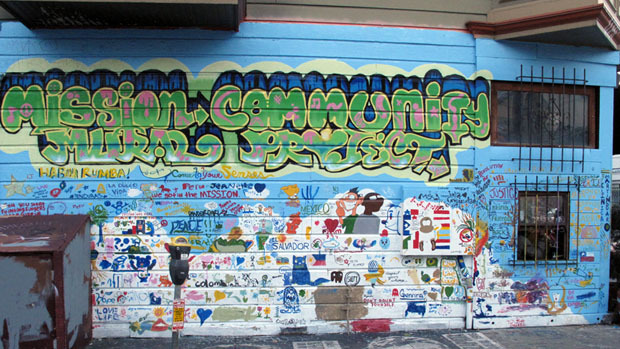 He oversees up-and-coming artists as art director for the Clarion Alley Mural Project. CUBA also helped create memorable murals on the side of Revolution Café at 22nd and Bartlett streets, most recently collaborating with Sirron Norris on the “Mission Community Mural Project” piece adorning the wall now (look above for a before/after look at Revolution Café). Though he lives in Russian Hill, Gregory Thomas feeds in the Mission. As a cub reporter, he happily avoids the doldrums of debt by subsisting on one $6 burrito per day. For fun, Thomas rides a multi-gear bicycle and plays pick-up basketball in Dolores Park.